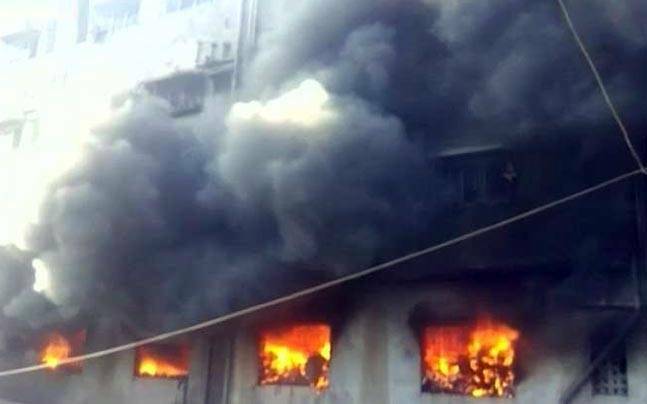 Major fire broke out at a small scale industry unit in Attapur, Hyderabad. Reportedly six people were killed in the fire. According to the police, the flames were spotted around 5 AM on Wednesday morning. The fire originated at EVON Battery at PVNR Express way Pillar No 253. Four departed identified as Irfan Khan, Ayub Khan, Saddam Khan and Saadhu. Although, the remaining two deceased civilians are yet to be identified by the authorities. According to an official, the deceased belonged to Bihar and Chhattisgarh. The manufacturing air coolers and battery operated vehicles unit is surrounded by suburban area. The official further revealed that generally four workers are present at the unit, but yesterday two more had joined. The owner of the manufacturing unit has been taken into custody because the preliminary investigation revealed that minimum required precautions were not up to the mark. The senior officer said, “A case of negligence will be registered”, adding that a proper investigation would determine the exact cause of fire that claimed six lives.